Preheat oven to 350 degrees F. Line 4 cookie sheets with parchment paper and set aside.In a medium bowl, combine the ground flaxseed and water; allow to sit for 5 minutes to form a gel.Meanwhile, in a large bowl, whisk together the oats, oat flour, shredded coconut, cinnamon, baking powder, baking soda and salt; set aside.To the flaxseed, add the coconut oil, almond butter, maple syrup, coconut sugar, and vanilla; whisk until smooth. Pour the wet mixture over the dry mixture and mix until just combined. Fold in the slivered almonds and raisins. 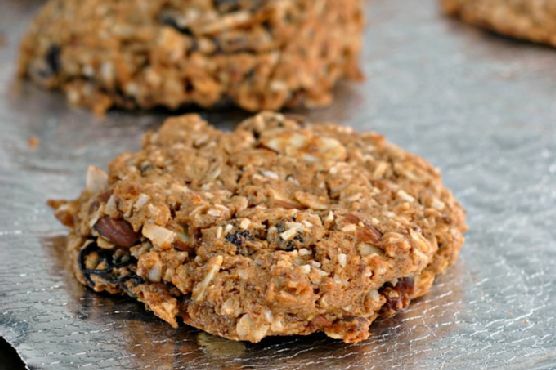 Using a cup scoop, heap batter onto the parchment paper and gently press down to flatten the cookie. Repeat with remaining batter. Bake for 12-15 minutes or until golden. Allow to cool completely on the baking sheets.